Here at SuggestMeSome.com, we try to spread the love and avoid promoting any single brand. 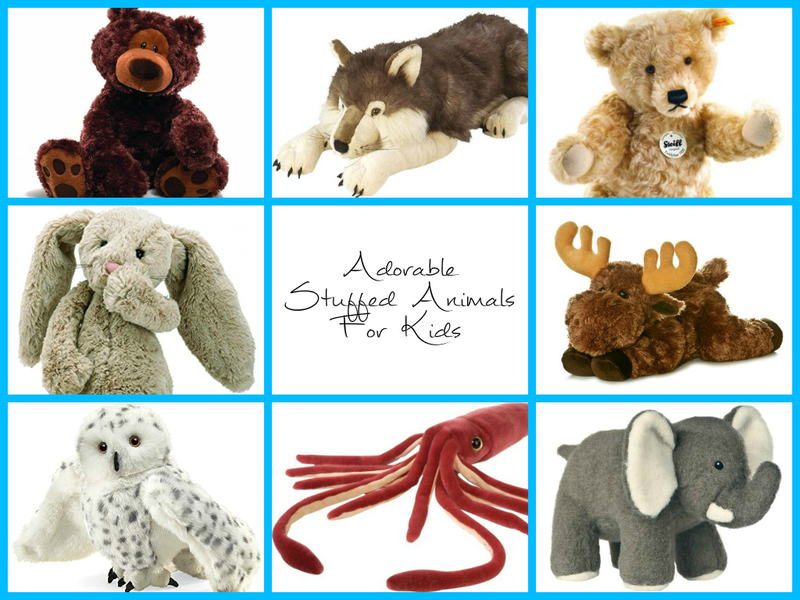 However, Melissa & Doug toys are a step above many other brands in both their quality and the thoughtfulness of their design, while remaining affordable for most families. 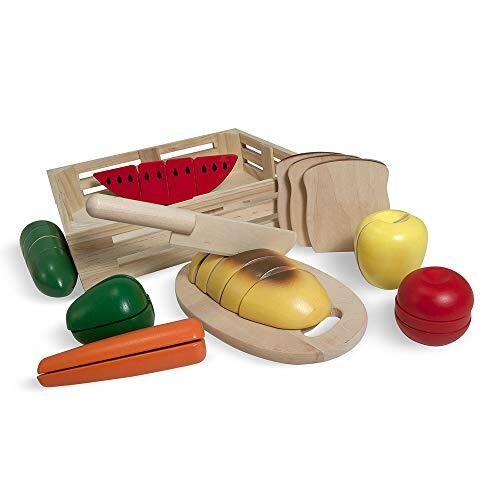 Melissa & Doug’s wooden play food sets are among their most popular toys, because they provide children with hours of imaginative play, while also encouraging skills such as fine motor skills and hand-eye coordination, and helping you stock a wonderful play kitchen for young chefs to cook just like Mom and Dad! This set, which contains a watermelon, carrot, apple, bread, tomato, and more to cut into chunks, is really popular with Montessori schools because it teaches cutting skills, which encourages independence and helps improve fine motor skills. If your children love this set, be sure to check out the Melissa & Doug Cutting Fruit Set (Wooden Play Food, Attractive Wooden Crate, Introduces Part and Whole Concepts, 17-Piece Set) as well! There are few things kids love more than a pizza party! 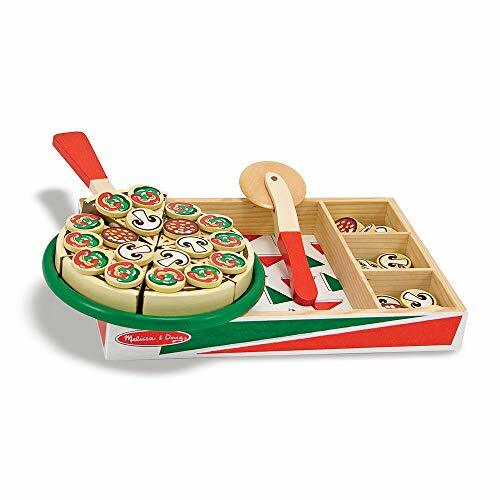 This pizza party kit comes with one pizza, three different toppings, and a nifty wooden pizza cutter that your children can use to slice up and serve the pizza. I scream, you scream, we all scream for ice scream! 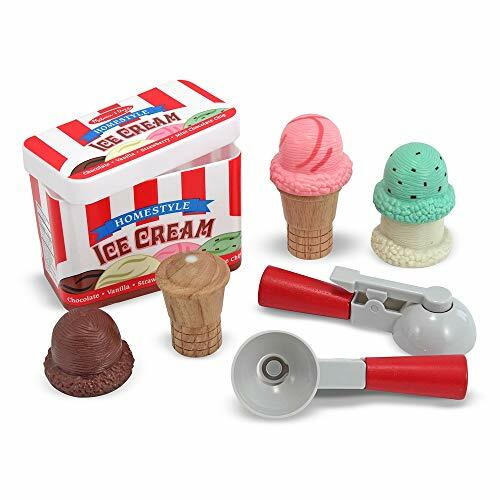 Children will love playing ice cream parlor with this set, which cleverly incorporates magnets to enable children to pick up scoops of ice cream just like a real ice cream scoop. The set features two scoops, two cones, four ice cream flavors, and a carton to store them in. 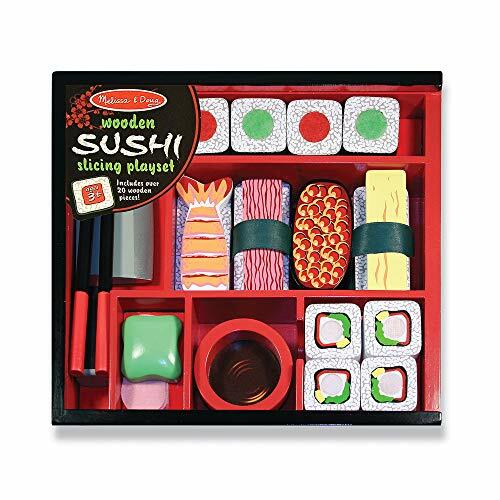 Another great set that helps children practice their cutting skills, this set also teaches chopstick skills with a pair of chopsticks with velcro on one end to help pick up pieces of sushi. If your family loves Asian food, this is a must-have set! Another cool Asian inspired pretend food set is the Melissa & Doug Stir Fry Slicing Set. This nifty play toaster set actually raises and lowers the bread, and comes with 2 slices of bread and 4 slice-able pats of butter. 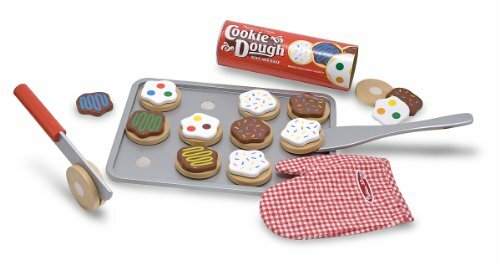 A perpetual favorite Melissa & Doup pretend food set, the Slice and Bake cookie set comes with a sturdy wooden cookie sheet and 12 cookies that young chefs can slice apart to practice their cutting skills and decorate with different frostings. If your children love this set, they might also like the Melissa & Doug Slice and Bake Wooden Christmas Cookie Play Food Set. What’s summer without a good BBQ? With this play food set, your kids can grill right along with you! This 20 piece set includes a hamburger with toppings, hot dog and bun, steak, ribs, chicken, veggie burger, and more – perfect for hosting a summer picnic. 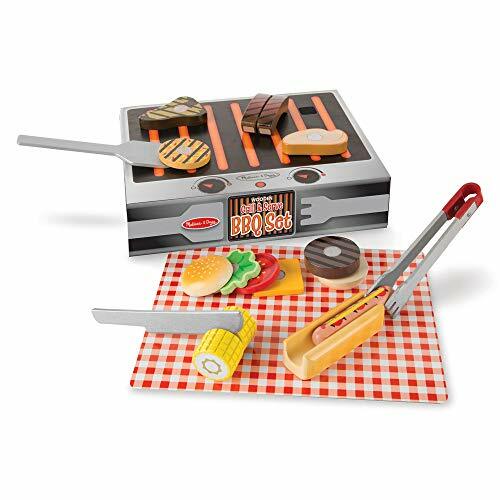 If your kids like grilling, they might also be interested in the Melissa & Doug Grill Set, which features kebabs and allows children to practice their hand-eye coordination as they put meat and veggies on the skewer. What’s more delicious than piping hot waffles in the morning? 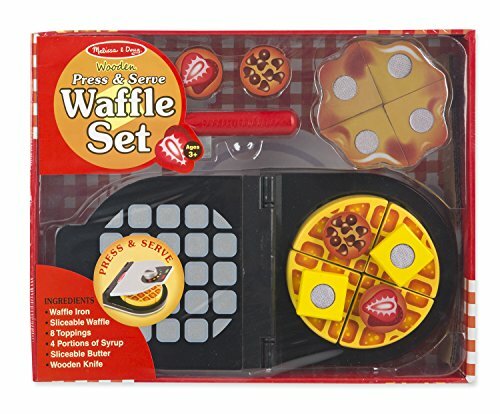 Now your children can make their own with this play waffle maker that actually opens and closes. The set also includes strawberries, chocolate chips, butter, and maple syrup to decorate the finished waffle with. 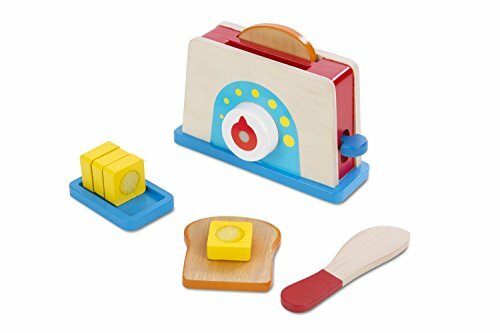 For another breakfast-inspired pretend food set, check out the Melissa & Doug Flip and Serve Pancake Set (19 pcs) - Wooden Breakfast Play Food. 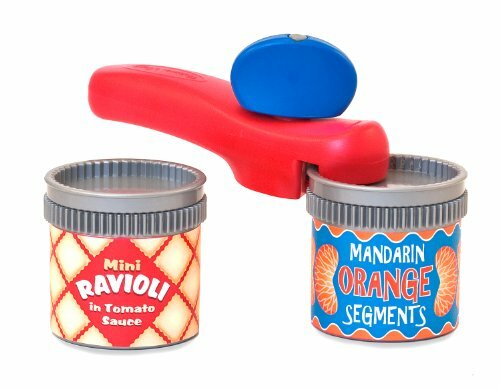 This small and inexpensive set helps improve fine motor skills with a working can opener and two jars with lids that really open after a few twists of the can opener. Now that you have a cookie sheet, a pizza cutter, a can opener, chopsticks, a waffle maker, and more, you may want a kitchen to put them in! 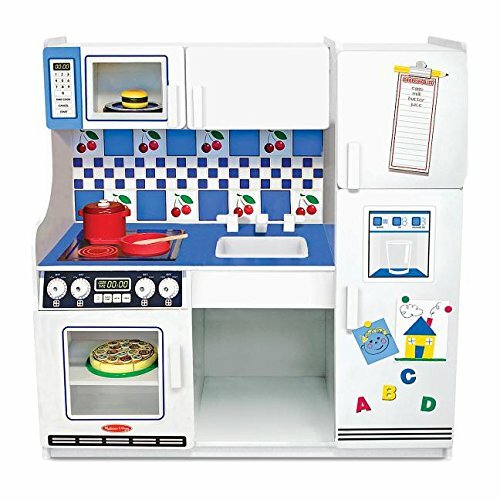 This sturdy, retro looking play kitchen has lots of storage area for your young chef’s cookware and play food, an oven for baking, a refrigerator/freezer for ice cream, and more, and it makes a handsome addition to any playroom. For a smaller and more affordable option, consider the Melissa & Doug Cook's Corner Wooden Pretend Play Toy Kitchen. Which Melissa & Doug play food sets are favorites in your family, and which ones are on your wishlist?